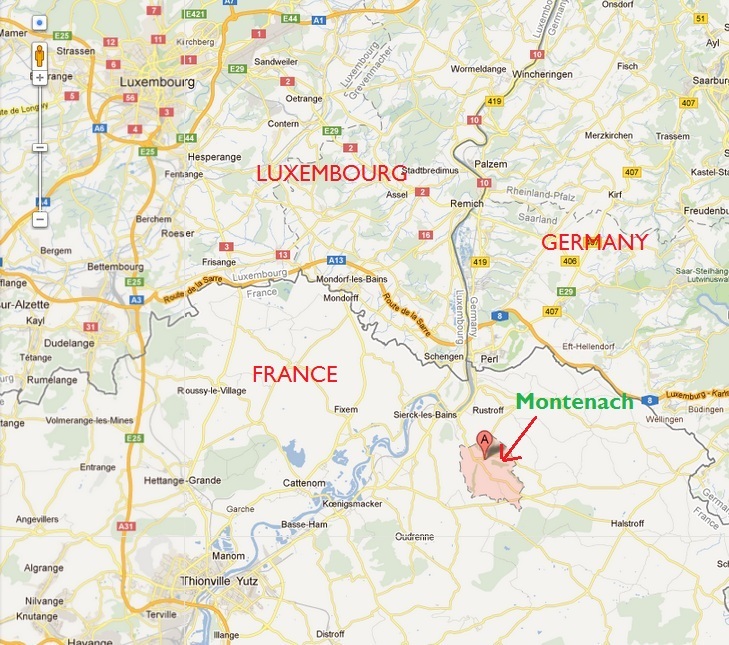 The 107-hectare reserve of Montenach, which even has a website (http://www.maisondelanature.eu/) is made of various habitats (humid valleys, streams, forest) but is especially famous for its dry calcareous grasslands, home to rare species of plants (23 species of orchids!) and animals. 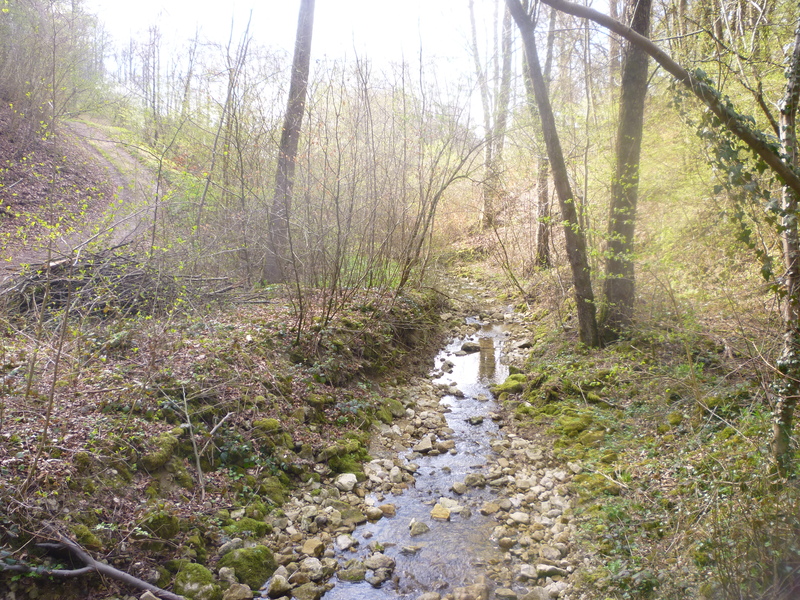 A 3.5 km walk goes through the reserve. 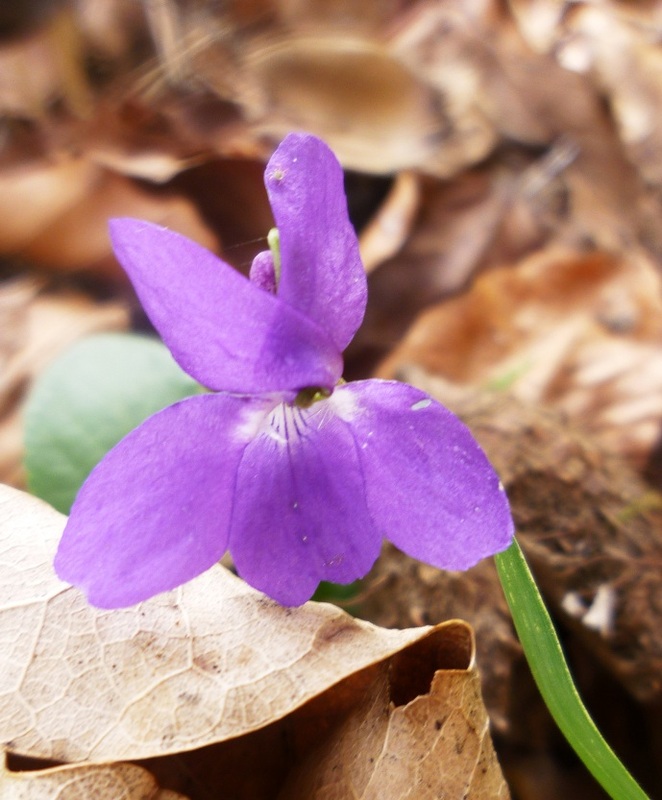 The best time to see orchids is from May 15th and June 15th, so it’s still too early. 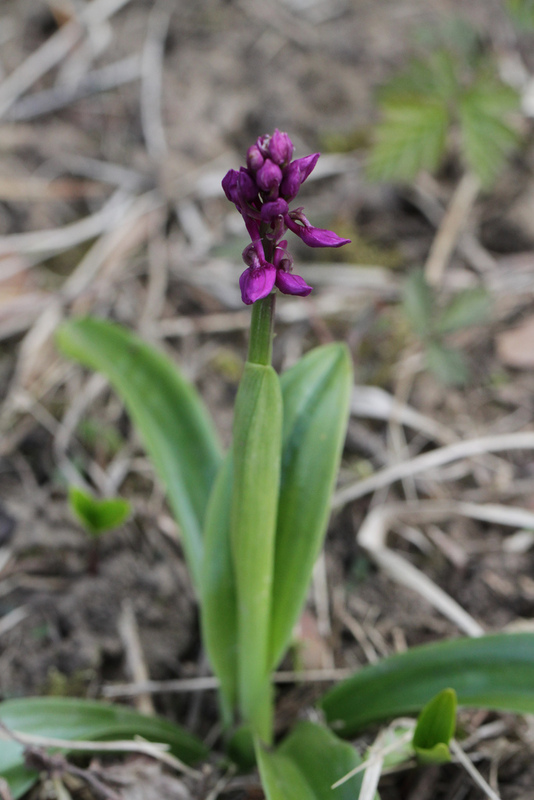 Here’s the Early purple orchid (Orchis mascula), which, as its English name states, is usually the first to bloom. But orchids aren’t the only treasure found there! 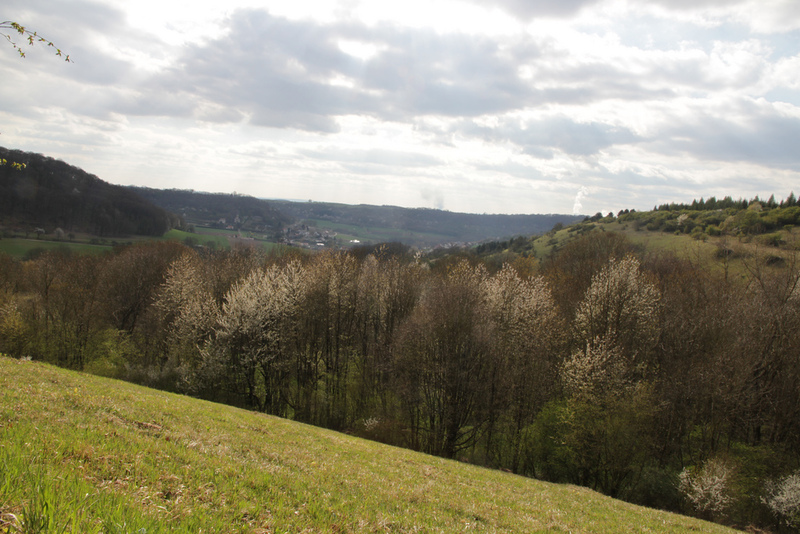 On the slopes of grassland, we can see yellow and purple carpets of cowslips and Viola hirta (the Hairy violet, with its dark and curled spur). 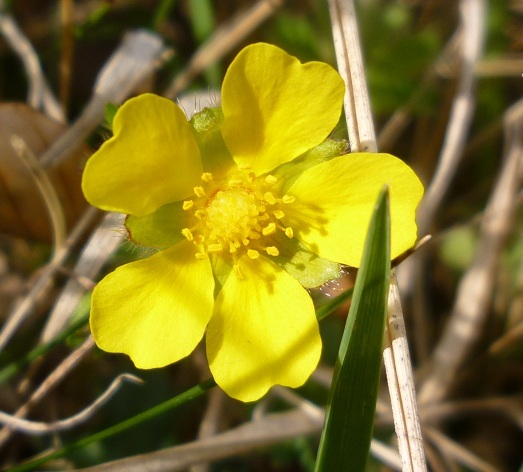 Other very characteristic plants of these grasslands are the the Common Milkwort (Polygala vulgaris), the Cypress Spurge (Euphorbia cyparissias, with yellow-green flowers and narrow, blue-green leaves), as well as two species of Potentilla (the yellow one is P.neumanniana, the Spring Cinquefoil, while the white one is P.sterilis, the Barren strawberry). 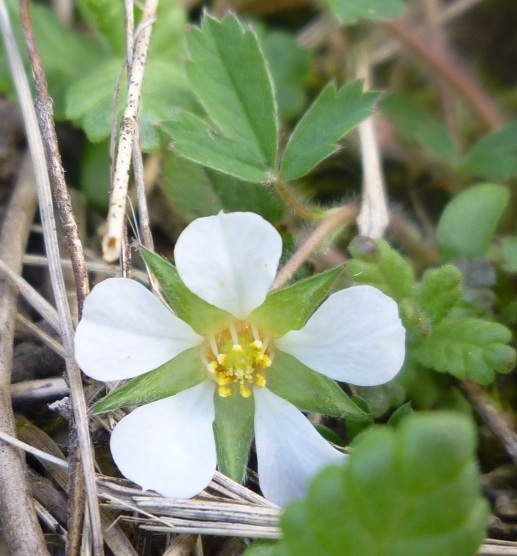 P. sterilis looks very much like the wild strawberry (Fragaria vesca), but the petals are overlapping in the latter. 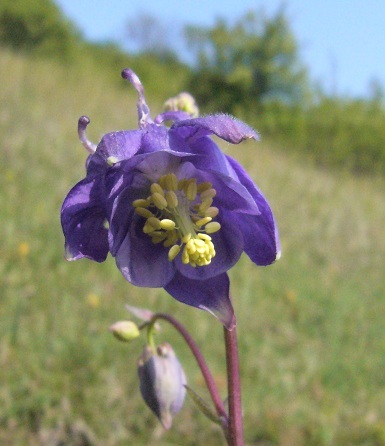 Later in the spring come the flowers of the Common Columbine (Aquilegia vulgaris, also known as Granny’s Nightcap…I can understand the resemblance!). 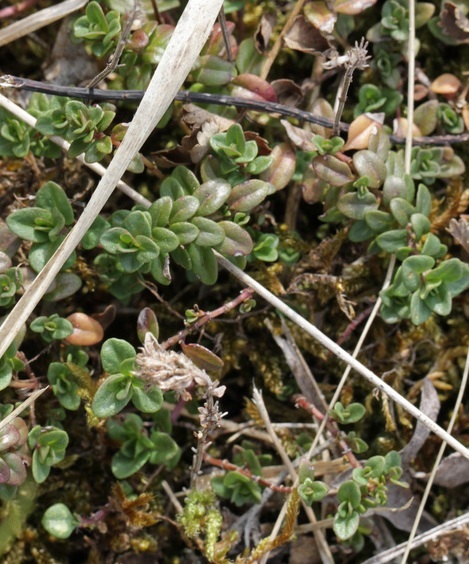 On stony patches we can also observe herbs like oregano or Thyme (Thymus sp.). This one actually smells like lemon, so it could be T. pulegioides. 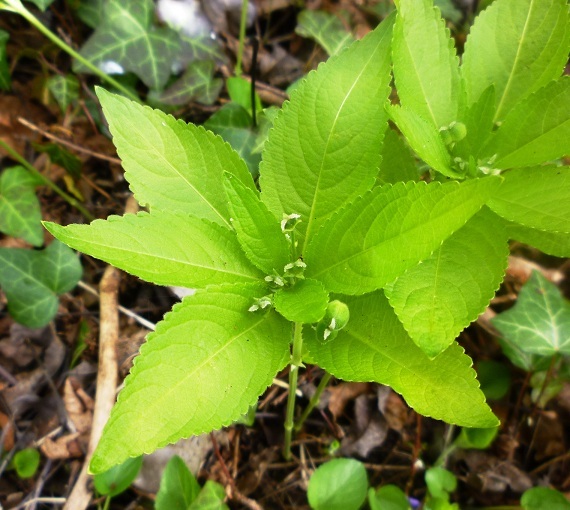 The forested parts of the walk are home to indicator plant species like Acer campestre (Field Maple), Cornus mas (European cornel, a kind of dogwood) or Mercurialis perennis (Dog’s Mercury), which bears rather inconspicuous green flowers. All those plants are found on calcareous soil. 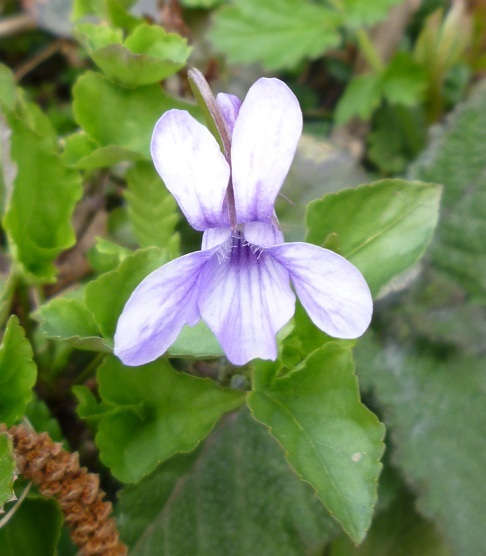 On the forest edge, another lovely species of violet is flowering at the moment, Viola reichenbachiana (the Early Dog-violet). I even managed to get a pic of a white plant! 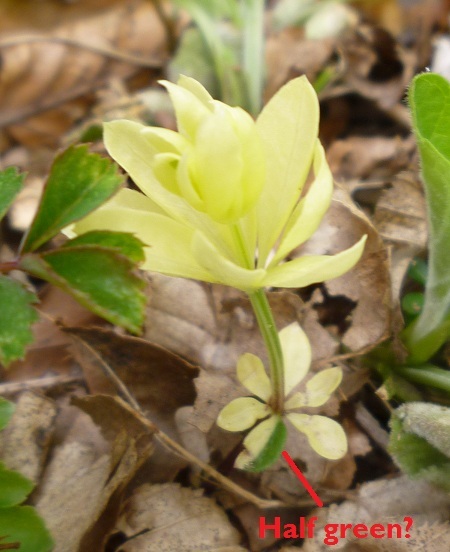 There are two characters causing such a bizarre look in plants : albinism (the plant does not produce any pigments) or hypochromy (reduced amount of chlorophyll, other pigments – like those found in petals – are produced more or less normally). Albino seedlings usually don’t live very long, but the plant I found has white leaves (except for one, which is half-green) and a greenish stem, so it can probably photosynthezise a little. 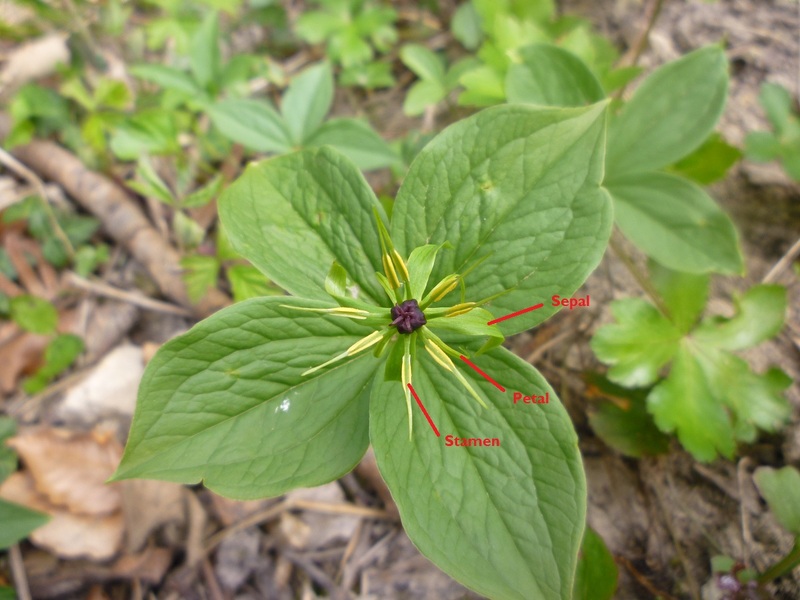 A bit further into the forest comes one of my favourite spring plant, Herb Paris (Paris quadrifolia). 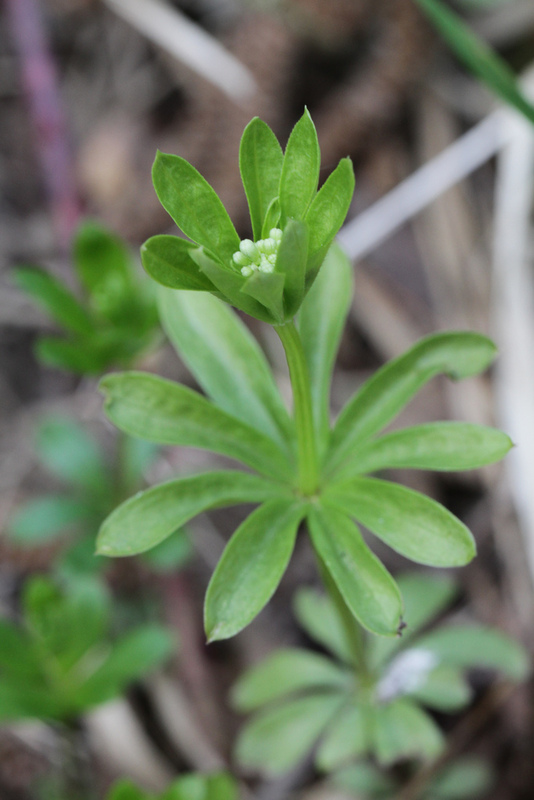 It is very easy to recognize with its whorl of four leaves. 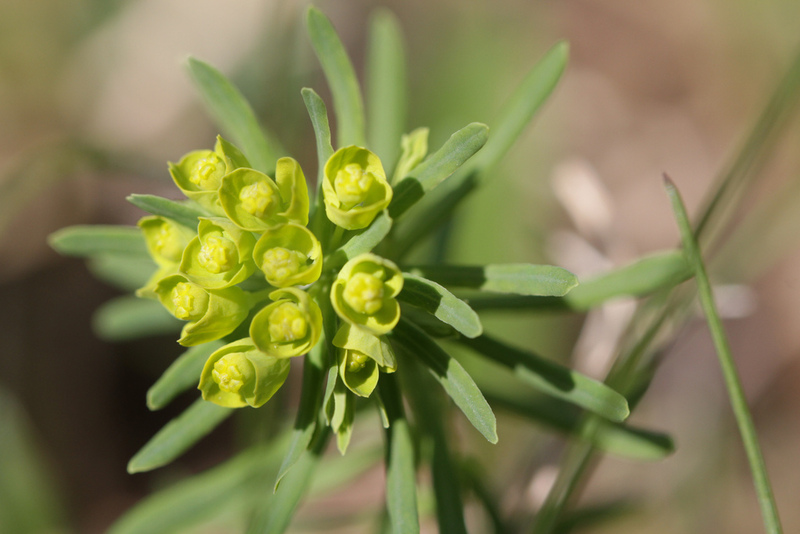 It bears eight pointed stamens, four green and slender petals, and four green sepals (these are called petaloid sepals, because they look exactly like the petals, just a bit larger). Doesn’t it look sweet? I hope I can go back to the reserve next week, and maybe show you some of the beautiful orchids that grow there! Previous Post A “Clandestine” plant ?